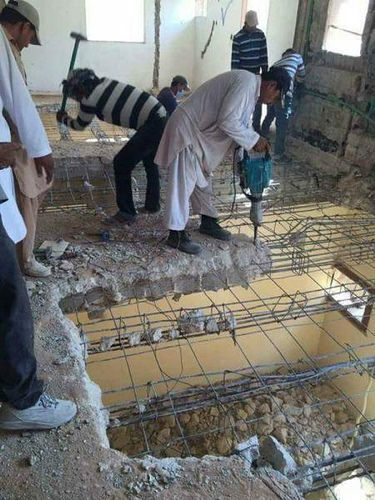 "The boss said this job had to be FLAWLESS you idiots." "No, no, I said it doesn't need sealing." It started out as a cat flap. "Are you sure the 50p coin was in your pocket when you poured the concrete, Hamish?" Let's get ready to rubble. "Lads, lads, STOP ....... I said next door, No 17"
These guys live above every Airbnb I've used. Downstairs, Billy Byrne was just getting the dimmer switches to work. "We're lucky the people in the ground floor apartment are out." "That's right lads- remove all of the walls and the floor, but leave the roof where it is." Keep up the hard work guys that mouse has got to be in here somewhere. The striped jumper gang were getting on well with the job but know it all Nathan insisted on poncing around with power tools. Its health and safety gone bad. Where D.I.Y. S.O.S. got it's name. "Right," said Fred, "'ave to take the floor up, this 'ere floor is gonna 'ave to go"
One man's floor used to be another man's ceiling. "You Plonker! When I said take the stairs..."
"The BBC news crew will be here next week. Hurry up lads we've still got half of Syria to destroy"
I don't believe I have any structural issues - or am I missing the storey? After a tipoff, the narcotics police were looking for concrete evidence. The Bricklayer's Arms was a great place to get smashed! "This week on Changing Rooms, we're going for the Fallout 4 look." That's another fine mesh Stanley has made. When the Wife asked for all new flooring how was I supposted to know she just wanted to replace the carpet with wood laminet? Breaking News. Two men injured after fall. Wife: Please call the builders. Husband: Na...me and the lads will do it.